Feel free to post any questions regarding the symposium and I'll do my best to answer them. The museum itself has been redone the last couple of years and has an excellent display of aircraft, including all of the "Century Series" jets that went into production. I will try to come to the August 31 Symposium. I am a member of the alumni council of Wentworth Military Academy in Lexington Mo. Our campus is on the historic register and includes a chapel and memorial that may be of interest to you. Robert Mooney was a Wentworth alumni who died flying P40's in China in 1942. A memorial was constructed in China and a replica was also built on the Wentworth campus. Mooney's father, Clarence, organized the fund drive for the building of the chapel which was named "Memorial Chapel" in honor of all WMA alumni who served in WWII. In front of the chapel is the "Mooney Memorial" which is well known to all WMA cadets who must memorize a brief history of the memorial as part of their induction. I hope you can make the symposium. I read about Robert Mooney in Carl Molesworth's excellent book, "Sharks Over China." I knew a memorial was erected in China (or should I say re-erected, since the original apparently was torn down in the 1960s by the Communists), but was unaware there was a replica at Wentworth. Thanks for providing that information. According to Mr. Moleworth's book, one of Mooney's good friends was Robert Liles, who was actually present when Mooney passed away following his bail-out. Liles went on to become an ace, and it's my understanding he was contacted regarding the upcoming symposium but unfortunately can't attend. I'm a member of the NCF but not one of the directors so don't know all the details about the symposium, such as exactly which aces were contacted about attending, but I've volunteered to assist in whatever is needed to insure it comes to fruition. As a result, I've been kept in the loop as to its progress. You'll notice there's no mention of the symposium yet on its website, but there should be once every little detail is finalized. The previous two NCF symposiums, for P-47 and P-51 aces respectively, where held at the museum as well. Most occur in the San Francisco Bay area, since I believe most of the NCF directors live around there, but the ones at the museum work out better for me since I live closer to it. Unfortunately, the NCF does not have a website of its own. Just a quick update on the symposium. Unfortunately, as of now it appears Joel Paris will be unable to attend. However, Sammy Pierce (also of the 49th FG) will be attending, which is great news! Attempts are still being made (and will continue into August) to see if other P-40 aces can make it, so I'll keep you posted on any changes or additions. One more update on the symposium. In addition to Aschenbrener, Jones, Morehead, and Pierce, Joe Griffin of the 23rd FG will be attending. From what I know of them, these men have some amazing stories to tell so this should be a great symposium. The official flyer should be out shortly, and when it is I'll be happy to post a copy here if there's any interest. I would be very interested! If anyone is going to the show, let us know how it goes and share some photos please. Also, if you could let the veterans know about this site I would really appreciate it. I will definitely be there and will post some photographs afterward. I've met Morehead and Aschenbrener before but not the other three aces, and am very excited at the prospect. I'll be sure to mention to them that there are a lot of P-40 fans out there! Okay, I've tried posting the symposium flyer, which I have in PDF format on my computer, with no luck. Any hints for this computer illiterate person? Mr. Aschenbrener and Mr. Jones were accompanied by their daughters, Heidi and Candice respectively, while Mr. Pierce was accompanied by his wife, Dorothy. It was a tremendous honor and privilege to meet not only the aces but their families. 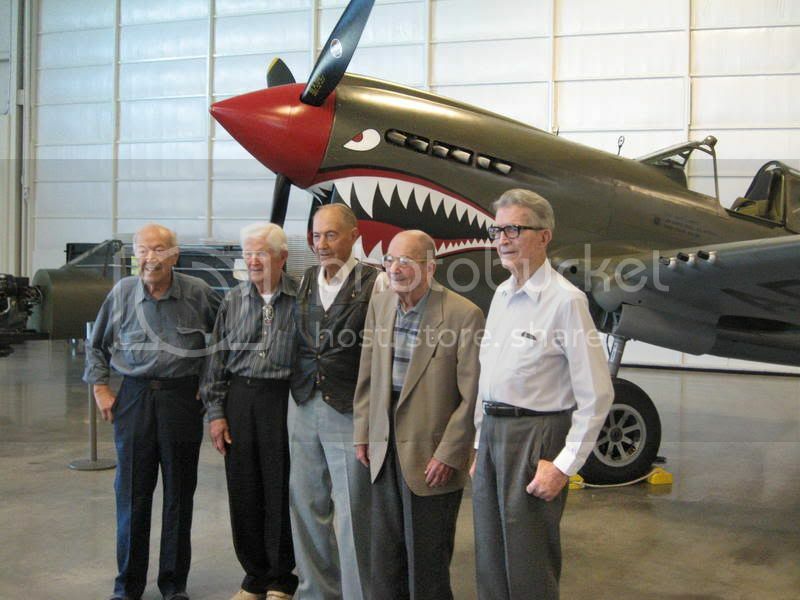 All five aces shared many interesting stories during the symposium, and were asked by the moderator, John Crump, how they liked the P-40. All but Mr. Jones later flew P-38's in combat, and all preferred the Lightning . However, Mr. Aschenbrener, Mr. Griffin, and Mr. Pierce (at least for the 'E' model) had some nice things to say about the Warhawk. The event was professionally videotaped, as are all these symposiums, and the DVD should hopefully be available in a few months from the Northern California Friends for those interested. I will definitely be buying several, one for me and some as gifts! Excellent photos and the symposium sounded like a great time! 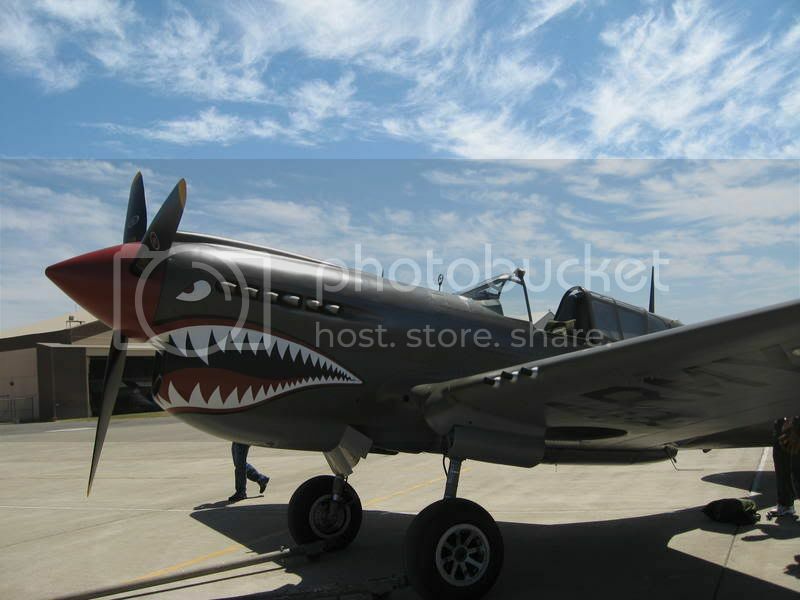 Hi, I am a new member and am looking for information on Lt. Richard H. Dennis a P40 pilot with the49th FG, 8th FS flyinging out of 3 mile strip in December of 1942. He went MIA on Dec 18 , 1942 near Kokoda, New Guinea. Is there any way to contact any of the four gentlemen who spoke at the symposium? They may have important information regarding Lt. Dennis and his last flight. Any help in contacting them or their family would be truly appreciated. Welcome to the forums! The symposium was five years ago and, unfortunately, time has taken its toll. I do know that both Aschenbrener and Morehead have passed away since. I don't know the current status of either Jones or Paris, nor do I have addresses or phone numbers for either. I believe Jones was last living in Texas and Paris in Georgia, if that helps. Good luck in your search! Thanks Mark. I knew it was too much to hope for. I will try and pursue the other two individuals from the symposium. Do you know if any of the attendees had any written material from their time in the 49th? Did they perhaps donate this material to a museum or even to one of the members of this forum? I was able to interact with the four aces at the time and don't recall any written material they brought with them. I'm also unaware of anything donated to a museum or forum members; however, the Museum of Flight in Seattle now houses the American Fighter Aces Association (AFAA) collection. The museum, specifically the AFAA, might be another avenue. You might know that Morehead wrote two autobiographies, "In My Sights" and "In My Sights Completed." I have both and, although off the top of my head I don't remember Dennis being mentioned, I can be fairly certain that no aircraft serial numbers were. I'll check to confirm this. By the way, Lynn Jones flew with the 23rd FG and not the 49th. Doubtful he would be of help even if he is still with us. Paris was not at the symposium. 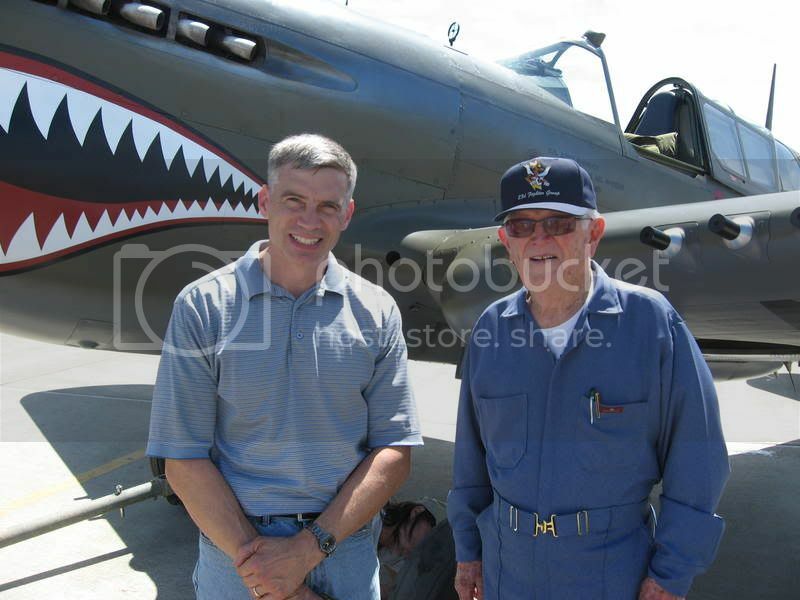 Also, Sammy Pierce, another 49th FG pilot who was at the symposium, has also passed away. Ray Melikian, who I mentioned in my other post, was someone else who came to mind, but I just did an Internet search upon reading your question and learned he passed away weeks ago. I'll ponder this and if anything else comes to mind, I'll let you know.